We were thrilled that we could all go to church together this morning - the first time since transplant. Everyone was delighted to see Jeremy (there were lots of comments about his hair!) and to watch him running around and laughing with Stephanie. He didn't make it to Sunday School, as the holiday program was still in place, and there were far too many children together in a room for us to feel entirely comfortable. However, he did visit the men's urinal as part of his "training", although he needs to work a bit more on positioning his feet. After church, he also had another "first since transplant" - a visit to the supermarket! He was very excited and ran around like a typical 4 year old, pleading with his parents to buy various items, and promising that he really, truly wanted to eat it (whatever it was, even though he didn't like it last time it was offered to him!). His appetite still seems to come and go - he had a smallish breakfast, a larger than usual lunch, and wasn't very interested in dinner today. He did seem to like the new juice we found at the shops and which reminded us of our time in Japan - a 20 vegetable & fruit juice that is predominantly carrot and apple, with what seems to be tiny infusions of other various delectable vegetables. Tomorrow is Jeremy's rescheduled bone marrow aspirate, so he gets to starve tomorrow morning. Please pray that everything goes well with his "special medical sleep" and that the results show that there is no leukaemia in his body. A full day at school hadn't put a dent in Jeremy's energy levels - he still charged into our bedroom at 6:30am and climbed all over us. It seems that his tiredness last week was just his body recovering from surgery and the infection. After the events of the past 2 weeks, both children were very happy just to spend the day at home playing together. Today was the first day back at school for Stephanie, and it was also discharge day for Jeremy. He had not experienced a fever for the last few days, and had generally been well. After the doctors came by for a final inspection, the nurse took out his femmoral line, which was quite painful for the little man (it was in the groin area and required a fair bit of pressure applied after it was taken out). The femmoral line was a temporary replacement for his central line, so that the nurses could take bloods and give antibiotics and other medications. There was also a pressure bandage applied over the area to help it stop bleeding and heal up. A special visitor arrived this morning (Giggle, from Camp Quality), however Jeremy declined to see him. Giggle is a hideous looking doll on a remote controlled tricycle that visits children in the ward. There is someone lurking in the background with the remote control and a headset to speak with the child. It scares most of the younger children in the ward (we have seen others scream and run away - it probably gives free nightmares). It is nice of them to make this effort to see the sick kids, but you would think they might have something more appealing for the younger kids? At least Jeremy wasn't afraid, he just treated Giggle with disdain. Yesterday afternoon, Jeremy was moved into a different room - the same room that he had his transplant (not the transplant recovery room). So now we have been back in the police room (where he first stayed after diagnosis), and in the transplant room (where the deed was done). It was quite strange, but good, seeing Jeremy run out of Camperdown Ward without any tubes attached to him. We were slightly delayed coming home, as the doctors decided to do a blood count this morning before they could remove the femmoral line (this saves Jeremy from having needles on Monday morning before his bone marrow aspirate). 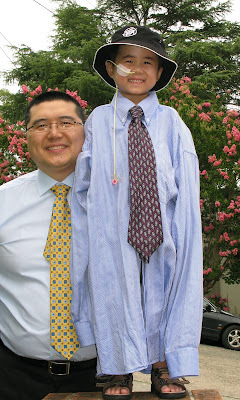 However, we made it back to school during lunchtime, and Jeremy was pleased that we were able to buy his summer uniform so that he could wear it tomorrow. He was also excited to see his sister and her friends, and played chasings with them outside the uniform shop! Although we rang yesterday to ask for some items to be put aside, we were told they were inadvertently sold. Thankfully, they managed to scrounge around and find the items from cancelled orders that seem to fit the little man. Today, Jeremy had another procedure - the removal of his nasogastric tube! The dietician was happy enough with his weight and eating (we have to remind him to drink more! ), so they said they would be happy for his nasogastric tube to come out. This stay at hospital has been confronting at times - it has reminded us of how frail our little boy can be, and how vulnerable he is to infection. However, we were also thankful for how he has progressed. When we were in Intensive Care, we saw other children who were not conscious, and required ventilators. We are also thankful for the 2 marvellous side benefits - the removal of his central line (albeit by emergency surgery), and the removal of his nasogastric tube. When Jeremy starts school, we will not have either of these things to worry about, and he will pretty much look just like the next little boy. We are looking forward to when we can take our little boy out of the house again. Jeremy had a good morning today, he played "shops" and managed to "sell" things to the doctors, and even asked for a pre-order for tomorrow! It got better when Stephanie arrived, as they started writing up lists of things to sell. Then the play therapist brought a bucket-full of plastic food, which then helped them visualise all the items they were selling. After seeing this, the play therapist came back with a shopping trolley, and for a while, Jeremy raced up and down the hallway with the trolley and his medicine drip stand. The doctors confirmed the bugs grown from both cultures was the gram negative infection klebsiella. They have now changed his antibiotics again to suit this bug. The doctors are now more confident that the rash does not appear to be GVHD, and do not think that it was caused by a food allergy. Their suspicion is that it was caused by all the toxins in Jeremy's body when he had the septic shower from the bugs in his line. Jeremy had a nice, quiet, restful day at hospital, managing to get a decent amount of napping-time during the day. There was no new news regarding the infection, but we are very thankful that he has not had a fever today. As we already know that he has a gram negative bug, they discontinued one of the three antibiotics (the one for gram positive bugs). The doctors came to have another look at his rash, and probably nodded and wandered off without comment. At this stage, it seems they will just keep an eye on it. Jeremy says it is not itchy, so I guess they aren't too worried. Jeremy was very pleased when the nurses removed the cannula from his right ankle - he was obviously in some discomfort from it, and even made a declaration that he would sleep better! Jeremy had not been eating much over the past 4 days, but when Dr Konkon showed up with a steak for Mummy, he decided that he was interested in food, and proceeded to eat about half of the meal. He also managed to eat a few scoops of the passionfruit gelato that was brought to him on Thursday (which he was not interested in at the time). It was a great relief to know that his appetite is back, as there were no nasogastric feeds available for tonight. Overnight, the nurses continued the slow process of weaning Jeremy off his drugs, and when he woke in the morning, they stopped it. Although he did sleep for longer than the previous night, his face showed he was still exhausted, so it was good that he piped up when his sister arrived. He was detained in ICU for observation until just after midday, when he was released to go back to Camperdown ward. Mummy was able to sneak downstairs for a short nap this morning. Jeremy and Mummy were both able to have a long afternoon nap today, and both look forward to a better nights sleep. Jeremy still does not have much of an appetite - he managed to eat one lychee in the afternoon. He was looking a lot better after this nap, and was keen to play games on the iphone - he even had a good time sharing with his sister! The wound where his central line was still has some blood there, we are told it may take a couple of days for the wound to close up - they did not put a stitch in, just sealed it over with a clear dressing. This afternoon, we noticed a slight rash on his arms, legs, and chest. It is not clear what it might be from, but they will keep an eye on it. They have confirmed that Jeremy has a gram negative infection, quite possibly a similar strain of ESBL he suffered from previously (unfortunately they are not sure yet as it takes days for them to grow these cultures). The doctors commented that when they took the central line out, it was clear to them that it was infected (they cut it up and sent it off to be cultured). This means that he will be kept for 7 days worth of antibiotics treatment. He is on 3rd line antibiotics, which will be changed once the particular bug is identified. Yesterday was 11months post diagnosis. Mummy didn't have much sleep in ICU with Jeremy last night - he made it through to about 3am when his blood pressure dropped to the point where ICU administered drugs to help stabilise it. Around 6am, more of this drug was given, and he was also given a fluid bolus to support it. Breakfast was ordered this morning, but the little man was not very hungry - he only ended up eating a few marshmallows before 9am. He was nil-by-mouth (NBM) from 4am Wednesday as he was due to have a general anaesthetic (GA), but then with all the events, he was sick and not hungry. Today, he was NBM from 9am, meaning that he was eligible to go into theatre from 3pm. However, he did not get his turn until after 7pm tonight. Jeremy had emergency surgery to remove his central line (aka "central venous line", "broviac line", or "hickman line"). This was the source of his infection (they told us it was a gram negative infection today). So we are thankful that it was spotted and the doctors made a swift decision to remove it. We are also thankful that Jeremy has had few issues with the line up until now. We know of others who have not been so fortunate, and had multiple issues. As Jeremy is past the bulk of his treatment, the central line is no longer so important - he will need to get used to having needles each time they need blood samples, and get used to cannulas being inserted. Apparently the wound site isn't very large, so hopefully it will be healing well by the time Jeremy starts school. Although he might still have his nasogastric tube in at the beginning of term. Jeremy might also be able to go swimming a lot sooner than we thought! We are also thankful that Camperdown ward is not very busy at the moment. We had been praying for the other children in Camperdown ward, so it was good to hear that the ward was not full, and that many children were able to go home on gate passes. This also meant that they were able to allow us to keep the room downstairs for the time being. Jeremy came back to ICU quite late, and as expected, was tired and not interested in food. Thankfully, the dietician had arranged for some nasogastric feeds to be available, and Jeremy will get some liquid food into him tonight. Hopefully Jeremy will have a good night tonight, and they will be able to completely wean him off the blood pressure drugs, as that is what brought him to ICU, and would be the thing keeping him there. Once he no longer requires it, he will be able to go back to Camperdown ward to complete his course of antibiotics. Jeremy's bone marrow aspirate did not go ahead today. They made it to hospital early this morning, and had blood samples taken. As they were waiting for the operation, Jeremy became tired and unwell, and then had a fever. He complained of a headache, they gave him a large fluid bolus, cancelled the aspirate, and admitted him to hospital. They were allocated a room in Camperdown ward this afternoon, and started antibiotics. Jeremy was quite happy this afternoon, until just after dinner. He then suffered a big fever, and rigors (shaking/shivering), and we called the nurses in. They in turn contacted ICU because he had low blood pressure combined with a high temperature. A second fluid bolus was given (smaller than 1st), and they watched him. He was quite stable whilst they observed him. But then after a while, Jeremy went back to sleep, and so they gave another fluid bolus (small size). As this 3rd bolus didn't appear to do that much, they called ICU, who sent representatives down again. They decided to give a 4th (big) bolus, watched for a bit, and then made the decision to send him up. It will be a long night for mummy, as there is no bed in the ICU room, she will need to make do with 2 chairs pushed together. Jeremy also suffered the indignity of 2 nurses and 1 doctor each trying to get a catheter into him - thankfully they gave up after that, and he gave up screaming. At least he is still able to be cheeky at times. The diagnosis is that the infection is likely to have come from his central line. Given his high temperature (40.9), it is likely they will grow something, and he will be kept on a 1 week course of antibiotics. Although Jeremy is so "healthy" and active, and the doctors are so delighted with his progress, it is still hard for us not to be anxious about the results of tomorrow's bone marrow aspirate. Previously, the doctors had told us that we can "relax" after he is in remission for 5 years (only 4 years and 34 weeks to go!) although I think that we will be always be worried everytime he has a fever or gets tired or ... We need to keep reminding ourselves that our God is a good God, and that He holds tomorrow - and that we can trust Him no matter what. Please pray that Jeremy will not get a fever or infection from tomorrow's procedure (like he did after his 2 months bone marrow aspirate), and that there is no leukaemia in his body. 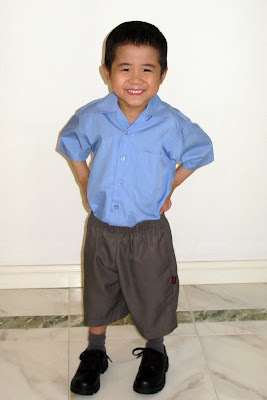 Jeremy is looking forward to starting Kindy and going to school "just like JeJe". This morning he practised wearing his new school shoes inside the house - he was so pleased when we laced them up for him, that he did a little song and dance! Due to his low immune system and isolation at home, we went shopping without him and bought several pairs of school shoes in different sizes - and then returned the ones that didn't fit! We still need to buy his school uniform (because we had not expected him to be able to start school so soon and thought we had all term to sort it out! ), but fortunately the uniform shop at school will be open a couple of days before school starts. Jeremy was running around all day, playing balloon volleyball and Wii and generally tiring out his parents and grandparents! We are so thankful that he seems to have boundless energy, and we pray that he will always be this way - that the results of his bone marrow aspirate next Wednesday will be "MRD negative" and that he will remain free of leukaemia for the rest of his life. This morning Jeremy had fun at Just-A-Ship park and Big Swing park - and the broken swing had been fixed at Big Swing park, so 2 laughing children had a swing each to enjoy. Tonight was Jeremy's last dose of anti-fungal medication. Now he is only on 2 medications twice a day - anti-viral tablets for another 8 months or so, and anti-pneumonia syrup for another 2 months or so. We are so thankful that Jeremy is now 4 months post transplant, and that he is getting stronger each day. He is full of energy, and is "on the go" running here and there from the time he wakes up until we put him to bed at night. He has more stamina than the rest of us, his sister included! He tells us that he is "never tired", and then asks us to chase him some more. Stephanie and Jeremy took advantage of a break in the weather to go outside and blow bubbles - then they wanted to pop them with their tongues! Praise God that the doctor is so happy with Jeremy's progress that he doesn't want to see him as often! Apart from his 4 month bone marrow aspirate next week, the doctor is now talking about monthly checkups instead of weekly ones. The doctor is still keen on Jeremy starting Kindy at the end of this month, even though his immune system will not be fully recovered and he will not yet have had any of his childhood immunisations redone. This also means that he will be able to play with his cousins and other little friends (provided that they are not sick), and venture out into the "big wide world" again (taking sensible precautions, of course)! The dietician is pleased with Jeremy's weight (even though it was down 600gms from last week), and told us to continue alternating between nasogastric feeds and no feeds at nights. She also told us that Jeremy's food restrictions can now be lifted - for Jeremy, this means he can eat tobiko sushi again! He is excited that he can eat "skin" on his fruit and veges too! Please pray that the results of his bone marrow aspirate next Wednesday 20 January will be free of leukaemia and that he will not get an infection from the procedure. Jeremy was so pleased with himself today - after tracing his name for a week, he announced this morning that he could write it all by himself and would "prove it"! So he did - in huge letters which filled up an A4 piece of paper - and then rushed off to practise some more. And tonight he proudly did it again to show BaBa when he came home. It is good that Jeremy will now let us push his medicines down his nasogastric tube at a very fast rate. For many weeks post-transplant we had to do it ever so slowly, otherwise his gut could not handle it and everything would come straight back up ... and we would have to give his medicines all over again! Some days he seems to be eating as much as Stephanie, so hopefully he won't need his nasogastric tube much longer. But then again, on other days he goes back to his old habits and only picks at his food. Today was a wii-free day, and was spent running around playing chasings. Stephanie is getting better at her skipping, and both the kids wanted beanbag rides. After remembering that he had eaten prawns and salmon in the past, Jeremy asked PawPaw and KonKon to cook it "like the last time". Unfortunately, Jeremy wasn't up to eating much salmon (a couple of nibbles) or prawns (a couple of licks). This was disappointing as he was very happy to eat plenty of "white fish" for dinner on Friday night. Jeremy and Stephanie played hide and seek in the morning and it was a fun filled exhausting day. First hospital visit for this year, and the doctor continues to be pleased with Jeremy's progress. We are thankful that his blood counts are OK and his weight is healthy. Since Jeremy has put on 300gms since last Wednesday, the doctor suggested that this week we alternate between nasogastric feeds one night and nothing the next night (ie. not even water through his nasogastric tube) and see how his eating and drinking goes. Jeremy was thrilled when we told him that he would not be hooked up tonight - he cheekily said that he would "muck up" in his room when he woke up in the morning! Stephanie and Jeremy had a wonderfully exciting afternoon wearing out their grandparents with all sorts of (non-Wii related :D) activities - playdoh, chalk drawing, plastic mechano, percussion instruments, dressing up dolls, bean bag rides ... the list goes on! I'm sure that 2 children (and 2 grandparents) will sleep very soundly tonight! Jeremy is still keen on homemade pizza, asking for it every lunch and dinner. We have had to stock up on tortilla bread, packaged sliced ham (because he cannot have deli ham due to risk of bacteria), and tomato paste! This morning the kids played hide-and-seek at the school playground, with lots of giggling when hiding. We were about to play on the equipment, when Jeremy tripped over and grazed his knee - so home we went to wash it in dettol. Jeremy declared that the dettol was "soft" and "didn't sting like an alcohol wipe" (it was only a tiny graze! ), and then promptly forgot about his injury until BaBa came home tonight. Stephanie and Jeremy were busy today play-cooking with playdoh, drawing with chalk outside, taking their stuffed toys for a ride on their cardboard train, and exercising their minds! As the weather was reasonably clear, we all went out for a walk this morning. It was good to be able to go out together as a family, even though we had to part ways because Jeremy cannot go to the shops or crowded places. After escorting Stephanie and Mummy to the edge of the shopping area, we strolled around the oval and watched some people playing croquet. Jeremy got to walk inside the concrete skateboarding area (no skaters had arrived) - fortunately, as we were leaving, a boy with a scooter came to practise his tricks and provide Jeremy with some entertainment. Jeremy ate a surprisingly large lunch today, one and a half homemade pizzas (tortilla bread, tomato paste and more ham than yesterday) - even more surprising, since last night was a nasogastric feeds night. This morning, he dragged Mummy downstairs and demanded rice and nori for breakfast. But he ran out of steam by dinnertime, and only ate a few bites of rice and nori. Tonight, he will be given water through his nasogastric tube - maybe he will eat 3 "normal" meals tomorrow!